Evolve is today's product for today's business. A totally new furniture system - Evolve is designed for the way people work today, with the latest technical and design features plus excellent performance. Stackable panel options are available, plug and play connectivity at the work-surface and a proven wire management system. 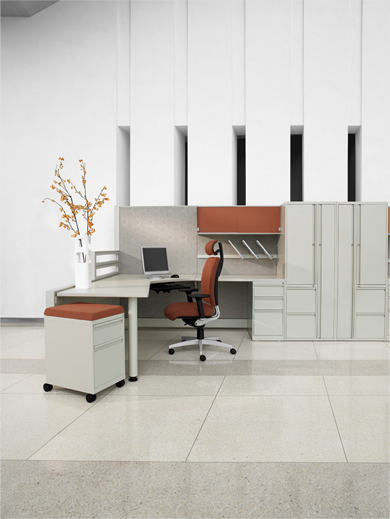 Ergonomic work surfaces have a host of shapes and sizes with practical and cost-effective storage options. Who says you can't afford what you really want? Undoubtedly, Evolve will meet your business' functional needs forever. But as styles and colors change, you may want to change with them. 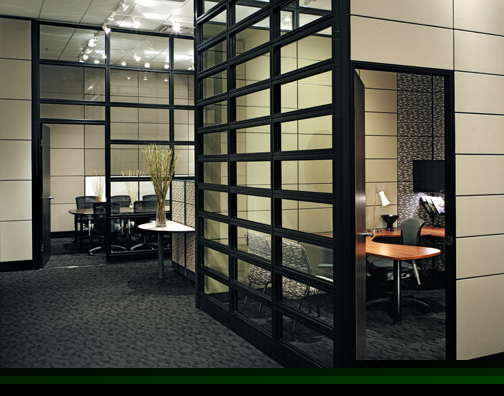 With Evolve, you can easily and affordably change your fabric and transform the look of your office furniture. When coffee or scissors go astray, Evolve allows for easy replacement of damaged fabric. EVOLVE has developed a panel interior made from 100% recycled wood and polypropylene. Through innovative design and technology, EVOLVE utilizes waste that would normally have been sent to landfill. EVOLVE's epoxy powder coating process involves no liquids and is solvent free. It does not contain any harmful VOC's or lead. Up to 99% of over sprayed powder is reclaimed, mixed with virgin powder and reused. All powder that doesn't get recirculated is recycled and used to paint non-exposed parts.